As companies evolve to adopt, integrate, and leverage software as the defining element of their success in the 21st century, a rash of processes and methodologies are vying for their product teams' attention. In the worst of cases, each discipline on these teams - product management, design, and software engineering - learn a different model. Don't buy this audiobook. Buy the eBook. 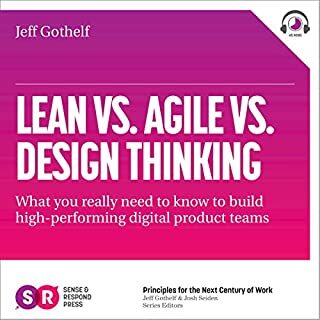 I have long been frustrated by how Agilists, Lean Product coaches and “D Thinking” advocates always seem to be competing around who’s methods are best. This book describes the flaw in that thinking and provides a path toward using all of them together to create high performance teams to drive value to the user.